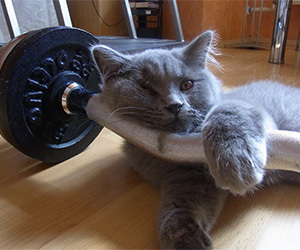 Does your cat seem unmotivated to pick up the desirable habits you’re attempting to teach him? Is he clinging to the bad habits you wish he’d give up? Well, you’re not alone: Changing a pet’s behavior isn’t easy. But with patience, consistency and the right plan, it is possible to train your cat to do what you ask. A key concept of any successful training plan is motivation. In the end, it’s all about ensuring the right behaviors pay off so that your cat is more likely to repeat them. A common belief about cats is that they do their own thing, in their own time, on their own terms, with no regard for what their owners may want. As a result, many cat owners believe that their felines are untrainable. In fact, cats are very similar to humans: They do what works for them and avoid anything that doesn’t. Just like us, our cats engage in behaviors that offer some sort of reward or pay off and avoid those that aren’t worth the effort or that result in punishment. It is important to remember that you can’t expect your cat to do the things you want simply to please you. Imagine if your employer did away with your salary and benefits and expected you to continue working just to please your boss. Sounds crazy, doesn’t it? Your cat may share a deep emotional connection with you, but to successfully motivate him to change his behavior it’s important to pay him in a way that he values. Start by identifying what motivates your cat. Does he have a favorite toy? How about a favorite treat? Or maybe he’s the type who just loves to curl up in your lap when you sit down. Identify the things your cat loves and then use them as rewards for a job well done. Be sure to offer a variety of rewards to keep your cat interested and stave off boredom. If play time is his favorite thing, for example, rotate toys on a regular basis to keep him interested. Your cat also needs to see the reward as worthwhile and equal to the effort he’s making. More difficult behaviors will require a more substantial or valuable reward than behaviors your cat naturally does or finds easy. Your cat may also value rewards differently in different situations: A high-distraction environment may call for an extra special reward, like flakes of tuna rather than just bits of kibble. Your cat’s mood may also influence the value of a reward — petting may be reinforcing when your cat is calm and settled while a rousing play time may be most rewarding if he’s feeling active and energetic. Finally, keep in mind that a reward only works to reinforce desired behavior if your cat sees it as a reward. So while you may think that petting and praise are a good way to acknowledge your cat’s efforts, your cat may not agree, particularly in situations where he’s anxious or distracted. Tailor the reward to both his personality and the specific situation. To keep your cat motivated, focus on rewarding desired behavior rather than punishing unwanted actions. Punishment is largely counterproductive and creates unnecessary stress for your cat without resolving the behavior issue. Spraying your cat with water when he scratches the couch doesn’t teach him to stop scratching; it teaches him that you are unpredictable and potentially threatening, and it doesn’t change the behavior. Your cat is still likely to scratch, but he will do so in a hidden location or when you aren’t around to see him. Punishment can also intensify other problems, like aggression or eliminating outside of the litterbox. Positive reinforcement is always a better option when you’re working to change a pet’s behavior. Make sure you’re not accidentally creating negative associations for your cat. Cats learn through experience what behaviors are — and aren’t — worth their effort. If your cat learns that hearing his name called results in a treat, he will learn to come when called. But if you call your cat and then give him a pill, he becomes less likely to respond to your call in the future. It’s important to make things like crating, pilling, nail trims and grooming — which your cat may see as negatives — as stress-free as possible. To do this, avoid asking for desired behaviors just before a situation the cat may deem as negative. So instead of calling your cat to you when it’s time to get in his crate, bring the crate to him. At the very least, offer an extremely high-value reward for the desired behavior. If your cat learns that taking her medicine earns her a delicious treat, the chances that she will do so willingly are increased over time.